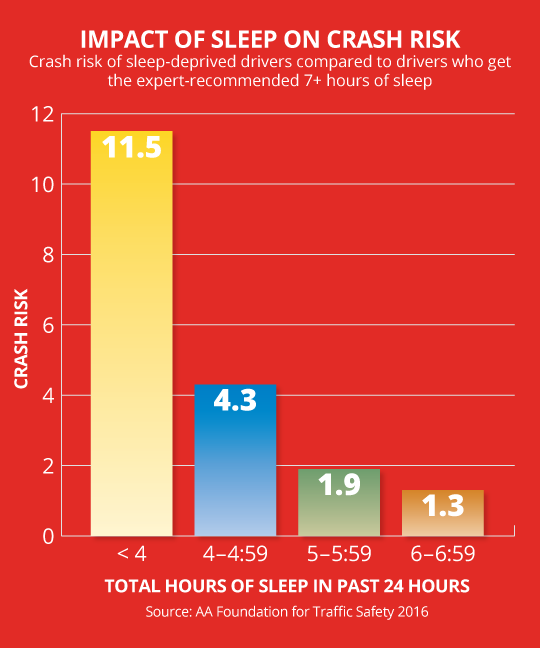 Getting a good night’s sleep will not only help you avoid a Drowsy Driving situation, it’s also a critical component to living a long healthy life. Get started on the path to increased alertness and better overall health by using the interactive checklist below to evaluate your sleeping habits. If you’d like a downloadable pdf of this checklist, click here. Use pre-sleep rituals to help initiate relaxation each night before bed. If you are not asleep within 20 minutes, get out of bed. Keep a regular sleep/wake schedule. Get a full night’s sleep on a regular basis. If possible, avoid naps. If needed, keep naps to less than 40 minutes. Avoid caffeine and alcohol within six hours of your bedtime. Exercise regularly, but avoid strenuous exercise within four hours of your bedtime. Avoid reading, eating, watching TV, talking on the phone, or using electronic devices in bed. Do not smoke or ingest nicotine within two hours of your bedtime. Avoid the use of sleeping pills. They can make sleep disorders worse. Always speak to your physician before taking any sleep aids. Recommendations compiled from the National Sleep Foundation, National Institute for Health, Centers for Disease Control and Prevention, American Academy of Sleep Medicine.